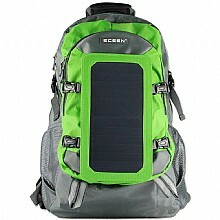 ECEEN Solar Bag Solar Charger Backpack With 7 Watts Solar Panel for Mobile Phones, Tablets, Android,,ECEEN Electronic limited. SOLAR CHARGER BACKPACK (7W) - Enjoy free unlimited on-the-go power with the ECEEN® solar charger backpack - perfect choice for any outdoor enthusiast. It comes with plenty of pockets & compartments for maps, documents and essential gear. 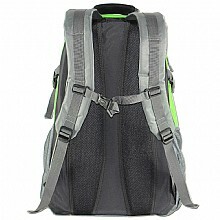 Perfect for backpacking, trekking, mountaineering, fishing or biking, it is made of high quality, rugged nylon fabric. 7 WATTS HIGH EFFICIENCY SOLAR CELLS - SUNPOWER® made-in-the-USA solar cells, with 22% transfer efficiency, are built into a protective anti-scratch hardened coating & sewn into high-wear PVC fabric for weather-resistant outdoor durability. CHARGE A VARIETY OF DEVICES - Charge your device directly through a 5V USB port, equipped with the protection of our Voltage Stability Controller, it is perfect for iPhone, Samsung & other smart phones, External Battery Packs, GPS systems, MP3 Players, Bluetooth Speakers and more! Ultra-Light. Ultra-Durable. Ultra-Awesome - The backpack is perfect for day-to-day use or occasional travel, and great gift for any age. It's made from rip and water resistant fabric, and provides strength and long-lasting performance, with minimal weight. Stress points are reinforced with bar tacking for increased longevity. 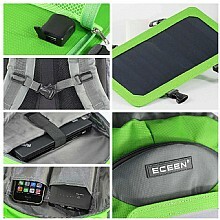 PACKAGE CONTENTS - ECEEN® Solar Charger Bag, 7Watts solar charger panel, 2 sets User manual and 1Pc Micro USB cable. Eceen, focus the sun, power around. 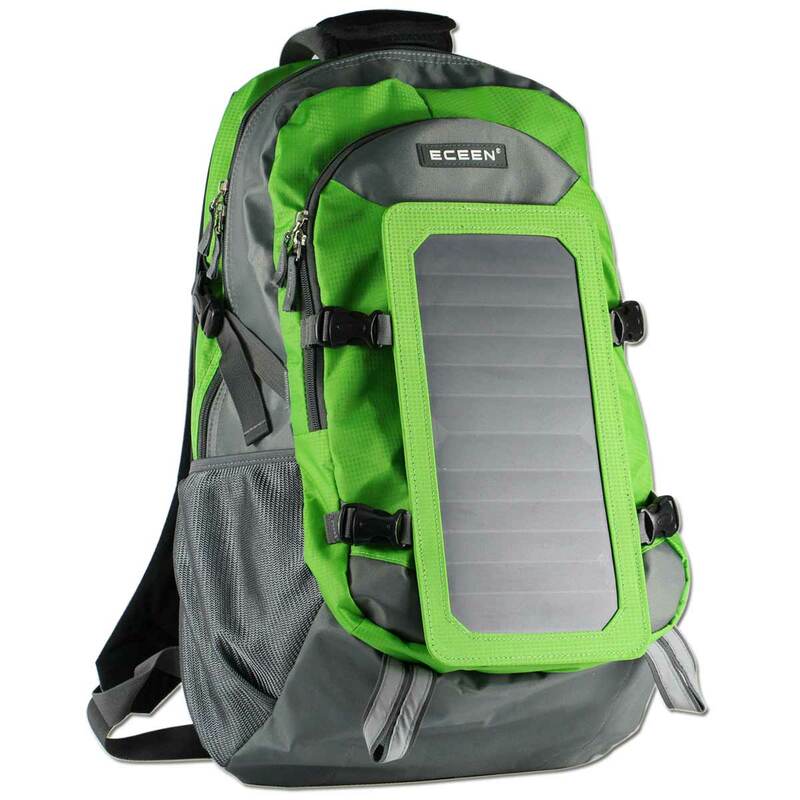 ECEEN® Solar Backpack captures more sunlight than conventional solar panels, which means it generate more electricity per panel. Enjoy the greatest happiness during your travel. 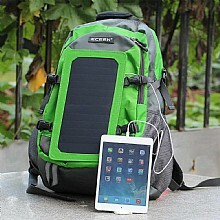 Removable and compact size solar panel charger design for portability, just hang it on backpack when outdoors. With a stylish look, this packable go-anywhere pack is for super-minimalists who make every gram count. Ultra-light. Ultra-durable. Ultra-awesome. The backpack is perfect for day-to-day use or occasional travel. Adjustable breathable straps make it easy and comfortable to carry for all day use. Features a classic shape with several pockets for storage and organization. This backpack has a roomy main compartment, Simultaneously, you can have enough space to restore other accessories like laptop/notebook backpack, pad, books, gadgets, keys; ideal for hiking, travelling and outdoor activities. 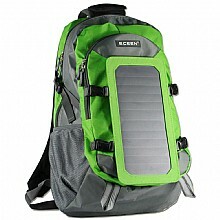 This product review is for the ECEEN 7W Solar Backpack. The bag arrived in perfect condition. It was packed safely in small rectangular box that was inside a much larger one. The backpack itself was inside a plastic bag to prevent any rips or stains. This is a nice, high quality bag. The green color is very vibrant and contrasts well with the gray. There is plenty of room to store all of your gadgets. Included inside the bag was a solar panel rated at 6.5W with SunPower cells as well as a waterproof battery pack rated at 10,000mAh. Mine came fully charged, with 4 out of 4 LED's lit up. Dual USB ports as well so you can charge 2 devices simultaneously. 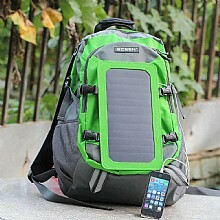 The solar panel attaches to the front of the bag via a small Velcro circle as well as 4 clips, 2 on each side of the bag. Once attached it is very sturdy and did not move much during my testing. On both sides of the bag, there is a mesh opening to hold your water bottles. Two regular 16.9 oz water bottles fit in there with no space issues. All of the zippers were very smooth and did not stick. The shoulder pads and the pads on the back side of the backpack are filled with thick foam. Even though I had the bag loaded up with my tablet, phone, snacks, and water, I did not feel any pain. I was able to charge my iPhone and Galaxy Tab 3 using the supplied battery pack and charging was at speed comparable to other battery packs. If you try to use solely the solar panel, it will take much longer so make sure your 10,000mAh battery is fully charged before heading out. The solar panel can be used as a last resort, a sort of emergency charger if the included battery pack dies. 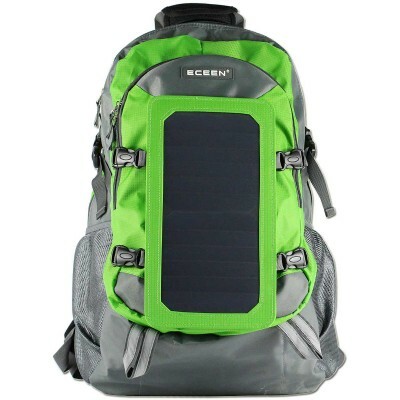 This is a great bag for anybody who loves the outdoors but at the same time wants to remain connected to the world. Nice waterproof, rugged material should last for years to come. I was provided a sample product for my unbiased and honest review. There is also a 10,000 mAH powerbank, and a solar panel included. The powerbank performs just as well as others I have tried. The USB ports are covered just in case to prevent water from falling in (perhaps from crossing the river and your powerbank drops in!) The power level checker is touch sensor based. The solar panel is very light weight and somewhat flexible. There are some solar panels that are really brittle and break at the slightest bend. This is not one of those, it could probably withstand a lot more. I expect it to last a long time. On the back of the solar panel, there is a USB port. There is also a mesh pocket held by a zipper. One can put their phone inside to charge. For the convenience on the road or on places where power is hard to obtain, this product makes use of the power of the sun.